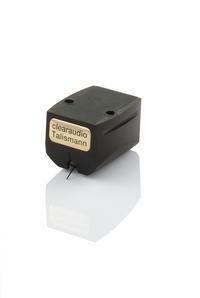 Clearaudio has significantly improved their fully symmetrical MC design, first patented in 1980. They have redesigned the generator in a revolutionary way by positioning and doubling the magnets (to 8 pcs.) so the coils are operating in a much stronger magnetic field. Furthermore Clearaudio has chosen the strongest magnetic material available: super neodymium. Through these achievements, the improved V2 generator efficiency has been raised by greater than 25% resulting in an output of 0.7 mV at 5cm/sec. Also, a new Micro-HD Diamond tip provides a hybrid parabolic geometry with a stylus radii of 0.008mm x 0.040mm. The total mass (0.00016g) is a fifth of the previous diamond stylus. The Talismann V2 Gold provides the entry level into the latest "V2" - Generation of clearaudio MC cartridges providing outstanding performance for less than $1,750. A major improvement over its predecessor is the use of a patented configuration of 8 magnets, which is characterized by the extremely wide dynamic range. In common with all the MC cartridges in the new "V2"- Generation, the Talismann V2 Gold is fitted with a Micro HD stylus (HD=High Definition) and a precision boron cantilever. The Micro HD diamond achieves a perfect contact with the record groove walls and by virtue of its extremely low mass, is able to faithfully reproduce even the most fine musical details. The body of the new Talismann V2 Gold is made out of hand-polished ebony with metal top plate and an internal metal-alloy resonance-suppressing block. The name "Gold" refers to the MC generator of the clearaudio Talismann V2 Gold, in which the coils are manufactured from pure 24-karat gold wire. The combination of these unique features sets the clearaudio Talismann V2 Gold apart from other MC cartridges in this price range. (1 Stars) 1 person(s) rated this product.